Landscape with Philosopher, 1996. Oil and Magna on canvas, 264.2 x 121.3 cm. Everyone knows what a Lichtenstein looks like: the stylish black outline, the uninflected printer’s-ink palette, the Ben-Day dots and super-precise images, so condensed and diagrammatic, with their unwavering sense of elegant design. Explosions blossoming in mid-air, jilted girls crying a river, the fighter pilot forever locked on his target – all preserved in Lichtenstein’s cryogenic style. Which, bent on deducing the basic grammar of other people’s images, and reprising it in one of his own, has long since become as familiar as the commercial art from which it derived. The opening room of the exhibition puts us straight in the picture. Lichtenstein’s ‘brushstroke’ paintings parody the mark-making of abstract expressionism (that was of formative influence), and bring to life his signature palette and cool style. In the next room, the engagement with popular culture is writ large, and includes a wonderful rendering of a Disney illustration, Look Mickey (1961). Given today’s ever more complex and precious copyright laws, I can’t help wonder if work of this kind can emerge now. Of course, we might say Lichtenstein, along with other pop artists, actually helped to intellectualise the discourse of intellectual property that has grown up around our image culture. In moving through the chronology of Lichtenstein’s work, Dorothy Lichtenstein’s comment about the constraints of the pop label becomes increasingly understandable. The works reveal an on-going commitment to explorations of the image as a set of complex aesthetic, conceptual and technical problems. The most ‘revealing’ room in this respect is arguably Room 9, which shows a set of ‘mirrors’, again all rendered using Lichetenstein’s characteristic use of Benday dots. Walking into the room is an incredible experience, as if you have walked into the pages of a huge book, as if engulfed by the grandeur of an illustrated fairy-story. 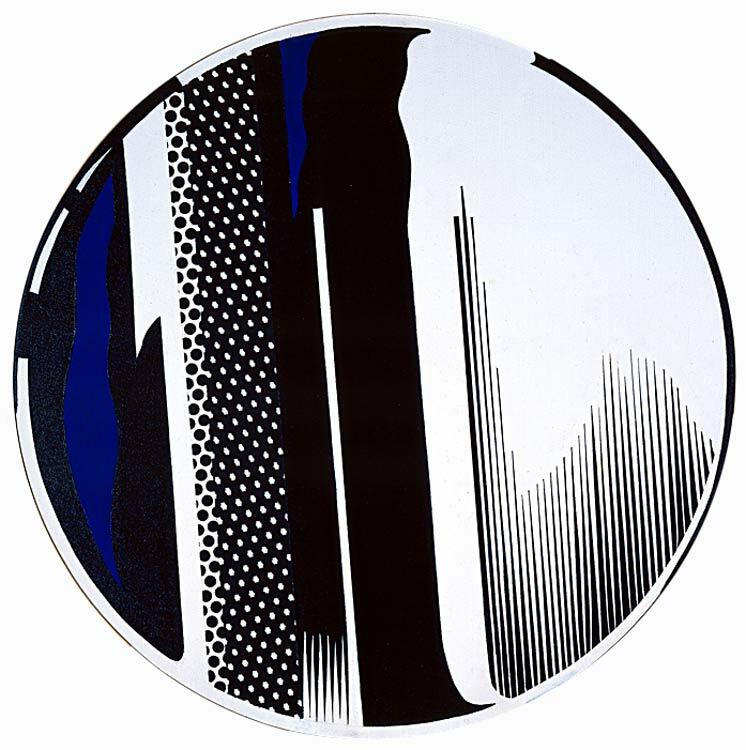 Lichtenstein painstakingly studied the pictorial conventions of representing mirrors and reflections in commercial catalogues. He also experimented with real mirrors, learning how different effects were produced with different lighting. Returning to the subject of the mirror again and again he painted many different versions – in each case, as a mock trompe l’oeil, the representation of the mirror fills the canvas, which is typically shaped to appear as an object we take to be a mirror frame. You know these are not real mirrors, you know they cannot offer reflections, yet as a room filled with the representation of many light incidents you cannot help feel emptied of your own image, as if all the mirrors of the world have been drained of the ability to look back. If only for an instance, entering this room of mirrors renders us one dimensional; an experience more profoundly self-revealing than standing before any real mirror. Lichtenstein’s paintings can be characterised as ‘metapictures’. W.J.T Mitchell coins the term in his book Picture Theory (1994). He describes metapictures as ‘pictures that refer to themselves or to other pictures’, which is to say they are ‘pictures that are used to show what a picture is’. The idea behind the metapicture is to consider what it would mean to ‘think’ about pictures without having to resort to a second-order discourse of any kind. As with other pop artists, Lichtenstein’s handling of popular imagery is less about the content of the imagery than their formation and mediation. ‘Brushstrokes in painting’, Lichtenstein once said, ‘convey a sense of grand gesture … But in my hands, the brushstroke becomes the depiction of a grand gesture’. On the one hand, then, the metapicture can be self-referential about its own formation. It is about the making of a picture – epitomised in Lichtenstein’s case with his persistent use of the Ben-Day dots as explicit reference to the technical process of print media. Equally, however, the metapicture can refer to images as a collection, or in terms of their genre. This sense of the metapicture is apparent with Lichtenstein’s rendering of comic-book imagery, Disney characters and also Chinese landscape painting. In Landscape with Philosopher (1996; cat 124, shown above) there is a shimmering ambiguity to the landscape, which gives a sense of mystery and/or a meditative quality. As Little puts it: ‘it is nearly impossible to tell whether the narrow white V-shape cleft at the painting’s lower center is to be read as in front of, or behind, the area of graduated dots on a blue ground to the immediate right of the cleft. Does the white cleft represent the sheer face of the cliff, or mist in a recessed valley or defile (i.e., is it a positive or negative space)? Traditional Chinese painters, especially of the late Ming and early Qing dynasties, delighted in this type of visual ambiguity, spatially challenging the viewer and creating an unsettling tension within the landscape’ (p.89). When one conjures to mind the works of Roy Lichtenstein, it is easy to think of their imagery taken from comic books and cartoons etc. And it is easy to think his work is simply an elevation or re-framing of popular culture. What is more difficult, but more rewarding to remember is that Lichtenstein was a painter through and through. Indeed, what you really experience when seeing so many of his works in the ‘flesh’ – as evidenced by the Tate’s retrospective – is how rich the canvases are and just how poorly they reproduce on page or screen. For more on the concept of the metapicture and debates of reproduction see Chapter 6, ‘Visual Culture’ of Image Studies: Theory & Practice (Routledge, 2013). See also Chapter 4, on ‘Drawing and Painting’. ← Drawing out (from) Barthes on Twombly: Seminar or Workshop?